Now taking orders for the second batch of handmade dresses! Please email caitlin.shhh@hotmail.com if you are interested! They are lovely! What are the prices for each dress? Thanks - they are $150 AUD each, plus postage. I really love the spots. Oh my, these are splendid! What sizes do you make them in? The dresses come in an Australian 8, 10 and 12.
size 8: 86 cm bust, 63 cm cm waist, free hips. size 10: 91cm bust, 68 cm waist. size 12: 96 cm bust, 73 cm waist. Skirt length is approximately 50cm from the waist and falls just above the knee of a 5'6 lady. I will have to be content with the very charming biscuit poster I just pulled out of my Frankie magazine. 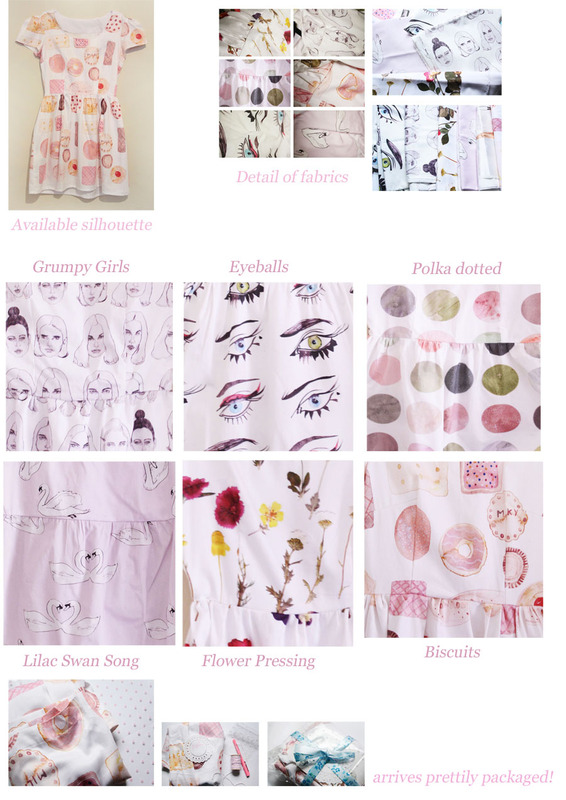 It really is such a brilliant idea putting your illustrations onto fabric and making them into clothing - art you can wear!! Sorry about that - because i'm just starting out and this is a very small business i'm not able to cover all the sizes i wish i could. I'd really like to be able to cater for everyone, and i hope someday i'll have the means to do so. I might add, that i can happily make a skirt to suit your exact measurements - do you think you might be interested?